There are stories told about Klein Winterhoek, a peak that soars to nearly 2,000 metres, situated high above the small Boland town of Tulbagh. The summit book tells of adventures and epics, and each account is part of the legend that is Klein Winterhoek. Andy De Klerk’s entry in the book after his epic solo first ascent of Wall of Silence makes for chilling reading, and folklore holds that he locked himself in isolation for days after climbing the route. For some reason, on my first ascent of the easier Frontal route, I neglected to read the book, so when I recently returned, I was excited to finally sit and immerse myself in the history of this iconic peak. There on the first page of what was obviously a new, book I found the line ‘The original summit book has been taken down for repair to preserve it for posterity.’ Bugger, that means I’ll have to come back. 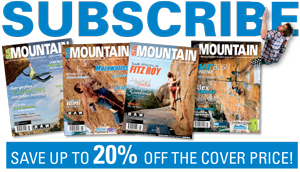 I penned in the record of our ascent – Tyrone Chan, Brent Russell, and Matthew Russell, 12 years old, possibly the youngest to climb the peak. It was lunch time and as most climbers know, getting to the summit is only half the job and it’s not over till the fat lady sings. And boy, the fat lady had a lot of singing left to do. The Frontal route on Klein Winterhoek, following the huge pillar on the eastern face of the peak, was opened by George Londt and party on New Year’s Day, 1921. It was a very serious undertaking, and at the time was positively ground breaking. 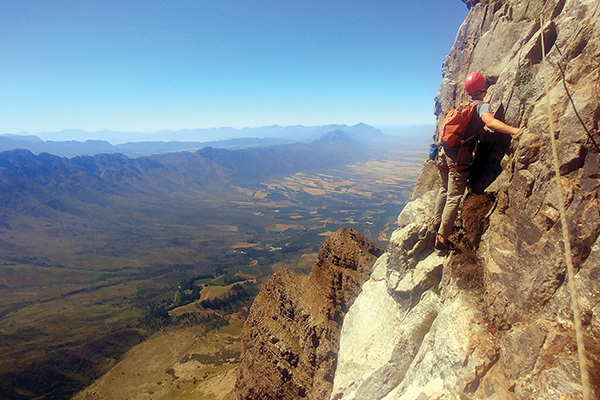 Londt died seven years after opening this iconic route in a big fall off the crux of Rainbow Crag on Table Mountain. One can only imagine what he might have accomplished had he continued to climb. The Frontal remains his masterpiece. It’s a beautiful, obvious, clean line with aesthetic climbing on mostly excellent rock – it’s amazing that a climb of that grade can push its way up such a huge wall. The location is stellar, the views are eye-watering, and the exposure stomach-churning for such an accessible route. Despite the fact that it is a ‘Big Day Out’, the route is one of the best country routes anywhere, and a must do.